The most successful people out there, the ones who appear to have it all together, are in on an amazing secret. They know of something that basically guarantees their potential for greatness and they make it a daily habit. Guess what, so do I! One might consider it a secret love affair. (That’s how amazing this is!) but I don’t want to keep this a secret! You should know about this awesome, life-changing habit. You deserve to be in on it. So, are you dying to know what my love affair is? It’s a love affair…with boundaries. Yep, boundaries. Boundaries are the secret to success. Defining strong, healthy boundaries is the most empowering action you will take as an entrepreneur (or, you know, as a human!). Boundaries communicate what you need, desire, and expect. They are necessary in order to operate in the best and most effective way possible. It’s not uncommon for clients to come to me with issues in their life or business. They have struggled for what feels like ages, working past their blocks, only to overturn even more frustrations. Almost every time, a lack of boundaries is the culprit. See, without solidified and well-communicated boundaries, there will always be a lack of order. Whether that’s mass chaos in your business or small and frustrating inconveniences, they will always be there. Expectations will not be met, and you will feel exhausted – both physically and emotionally. What is a firm boundary? Let’s be clear – – we should all establish boundaries. Boundaries are not just for the boss, they are not just for adults and they certainly are not for “someone else.” Boundaries are for you! For example, one of my strong personal boundaries is not to working when I have my kids with me. I am a single parent and am only with my babies 50% of the time. That means, when we are together I want to be completely present. And, let’s face it, when I am working I want to be completely present also. This staying focused and present thing is no joke and it takes serious boundaries to achieve. I strive to spend my time with my kids intentionally, and this firm boundary permits me to do so. This works for me and my family, and it aligns with my values. While the word ‘boundaries’ sounds constrictive, having firm boundaries actually allows for great freedom. It provides you with the ability to live your life on your own terms. With firm boundaries, you halt living in a consistently reactive state. In turn, a firm boundary does not always involve other people. In fact, it could solely be a line you draw with yourself. Are you discovering you fill your precious spare time with social media scrolling? Maybe you compulsively check your emails. No matter the distraction, setting a firm boundary around these activities will increase your productivity (and overall happiness) in ways you cannot imagine. Boundaries with yourself may not pop up on your radar, but it is certainly of utmost importance in terms of personal freedom. I challenge you to think about the ways in which these kinds of personal boundaries could change the course of your day. How do I create these boundaries? Knowing what a boundary is and why it’s important is great, but nothing truly changes unless you create boundaries in your own life. Identifying and setting up systems around the boundaries you establish clears space for you to do your work in the way you desire. Without the system, your boundaries won’t hold. Likewise, the idea of which system to set up depends on your goals. But, and here is the most important thing when it comes to boundaries, you must clearly communicate these boundaries with everyone they impact! One of my favorite ways to do this is sending out a welcome letter to all new clients outlining expectations (what they can expect of me and what I expect of them). Clearly established boundaries, from the beginning, is a great practice to follow. Communication is the most important aspect of establishing boundaries, and starting relationships with that open communication make all the difference. You know what boundaries are. You know why they’re important. So now what? How do you put them into play in your life? That is where true grit gets involved. This worksheet walks you through creating your Boundary Blueprint. With a little productivity planning, you can make establishing these boundaries a daily habit. Before you know it, tasks will be streamlined in a way you didn’t realize possible. You will see the light, and you won’t want to turn back! Take control. OWN your life! Your future truly is up to you. Remember, if you ever feel stuck, I am here to help. 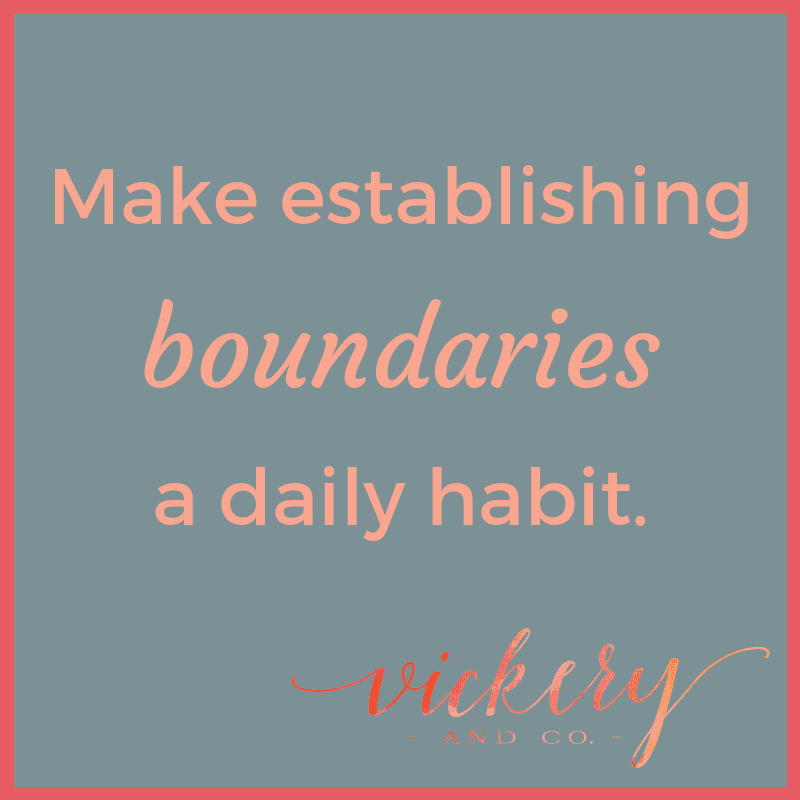 Boundaries are my jam, and I would love nothing more than to see you thrive. Schedule a Virtual Coffee Date, and we’ll discuss working through your Boundary Blueprint together!